Cal Fire personnel observe the Ranch Fire, part of the Mendocino Complex Fire, on August 7th, 2018 near the city of Ladoga, California. Verizon throttled the Santa Clara County Fire Department’s supposedly “unlimited” data plan while the agency was fighting the record wildfires that have burned over one million acres of the state, Ars Technica reported on Tuesday. Bowden’s declaration was submitted in an addendum to a brief filed by 22 state attorneys general, the District of Columbia, Santa Clara County, Santa Clara County Central Fire Protection District, and the California Public Utilities Commission. The government agencies are seeking to overturn the recent repeal of net neutrality rules in a lawsuit they filed against the Federal Communications Commission in the US Court of Appeals for the District of Columbia Circuit. According to Bowden, County Fire IT staff verified the connection was being throttled, which “severely interfered with the OES 5262's ability to function effectively.” When those staff reached out and said the throttling was impacting public safety, Verizon customer support personnel confirmed they had deliberately limited OES 5262's connection, but that it would only be restored if County Fire switched to a more expensive plan and contacted the billing department. As a result, fire personnel were forced to use other departments’ service providers as well as their personal devices until County Fire paid up. Bowden wrote those personnel were deployed to help fight the Mendocino Complex Fire, the largest in the state. 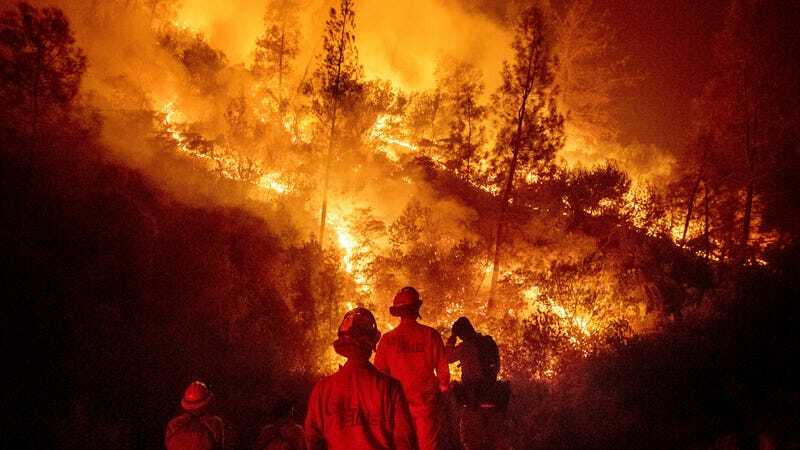 The Los Angeles Times reported this week that fire is extremely hazardous to the nearly 3,500 firefighters currently fighting it, with Draper City, Utah fire department Battalion Chief Matthew Burchett dying this month while trying to help contain the blaze. In general, the blazes across the state have increasingly exhibited extreme behavior like immense fire tornadoes. Adding a service provider dispute to this situation is indisputably not helpful. While Verizon ultimately did lift the throttling, it was only after County Fire subscribed to a new, more expensive plan. In light of our experience, County Fire believes it is likely that Verizon will continue to use the exigent nature of public safety emergencies and catastrophic events to coerce public agencies into higher-cost plans, ultimately paying significantly more for mission-critical service—even if that means risking harm to public safety during negotiations. It’s true that throttling a plan that goes over its data limits isn’t necessarily a net neutrality issue per se. The Obama-era rules didn’t prohibit data caps; they prohibited service providers from artificially slowing down or blocking specific content in a discriminatory fashion, whether it’s to limit their customers’ access to rival services or just charge extortionate fees to access certain content. But Bowden’s argument appears to be that County Fire’s experience with Verizon led him to believe they are quite willing to do just that to emergency personnel. Can We Afford to Keep Rebuilding in the Line of Wildfires?